This page is still in preparation, but may nevertheless be of interest in its incomplete state. J.D Philipps und Söhne mirrored in Frankfurt what Welte und Söhne were doing in Freiburg-im-Breisgau. 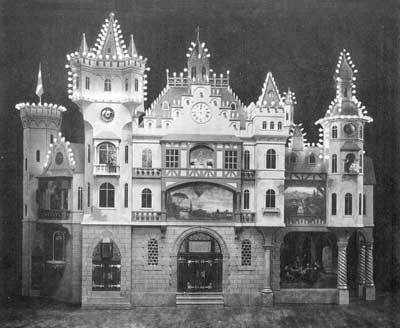 Johann Daniel Philipps had set up in business on his own in 1886, having split from his existing partner, as a manufacturer of orchestrions and pianos, later taking his sons into the family business. 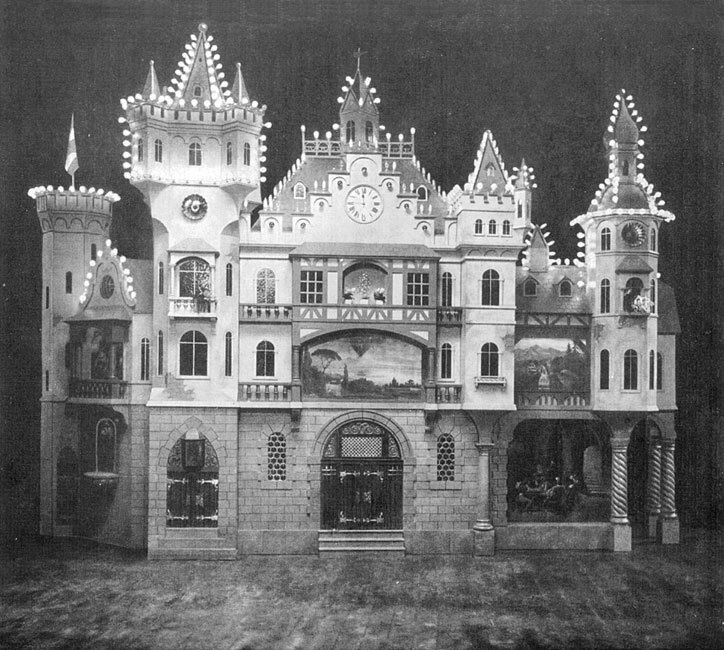 The firm was a very large one; by 1910 it had manufactured forty-seven different models of orchestrion, twelve different electrical pianos, twelve player pianos, seven expression pianos, and even a roll-playing piano and harmonium combination for cinemas, not to mention its normal pianos and harmoniums, and it was introducing five models of the new Duca, a fully automatic reproducing piano, on to the market. 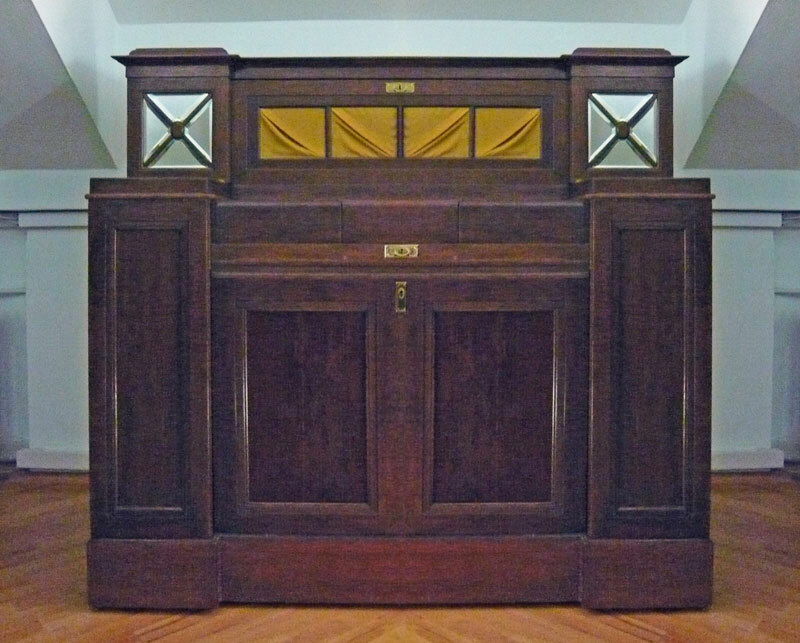 Philipps Orchestrion Model no. 45 - yes, really! The first recordings for the Duca took place in late 1908, implying that the instrument was ready for general sale by 1909, which makes it the third and last of the early German reproducing piano systems to be put on sale. 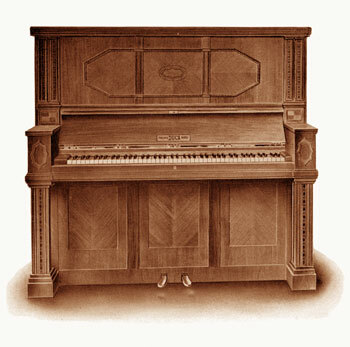 As was the practice at Hupfeld, the recordings made by pianists were used not only for the full reproducing pianos, in this case the Duca, but also for the various expression and normal player pianos which the company manufactured. 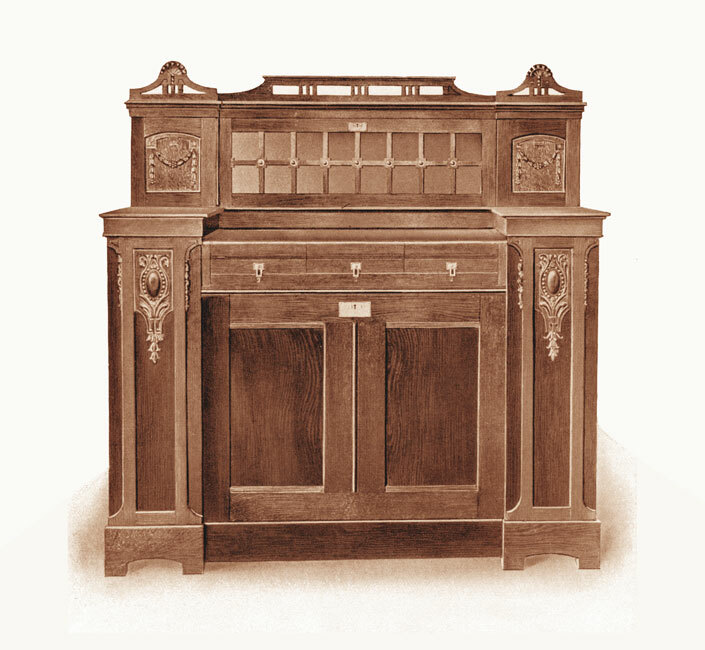 By the time the Duca came on to the market, Welte was already installing its reproducing system into upright pianos, and it is likely that the Duca cabinet model, seen at the top of this page, was simply one of a number of variants produced at roughly the same time, and did not precede the internal players, as was the case with the Welte-Mignon. 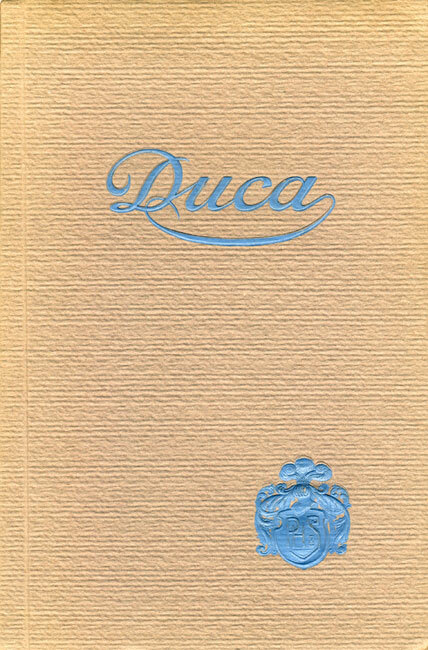 Since the Philipps Duca is so little known, there is at present no musical example, but it seems clear that the Duca was a remarkably faithful system. It is sometimes very difficult to interpret a pianist's actual sentiments behind the florid language of printed testimonials, but Frederic Lamond, a Scottish pianist who was nobody's fool, and who had recorded for Welte in 1905, was prepared in mid-1909 to assert that the Duca was "the best reproducing piano of the present time." Precious little is known about the details of recording for the Duca. 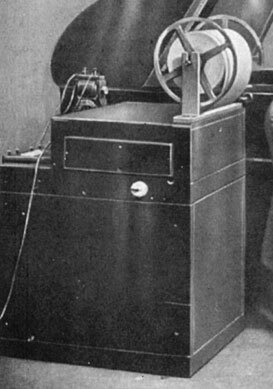 In various Philipps catalogues there are clear illustrations of the recording machine, which appears to have marked up blank paper as the pianist played, although the only significant visible details are the feed spool, the electrical connections to a junction block underneath the piano, and what appears to be a transformer or rectifier with supply cables attached. As with the Welte-Mignon, the connections to the piano were made electrically, not so surprising for a company which went on to develop and manufacture electrical motors and solenoids. 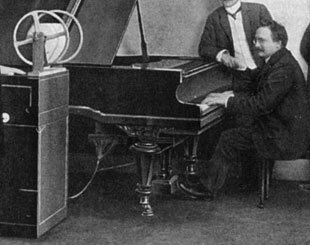 In the photograph of Willy Rehberg at the recording piano in May 1909, two separate cables can be seen running from the marking machine to points below the piano case. One is clearly a multicore cable, perhaps with one connection for each note, joined to some form of electrical or pneumatic primary signal block, and the other is perhaps a supply cable to the presumed contacts under the keys. The physical details of this recording process are only visible on photographs taken in 1908 or 1909, so it is possible that the methods changed over time. 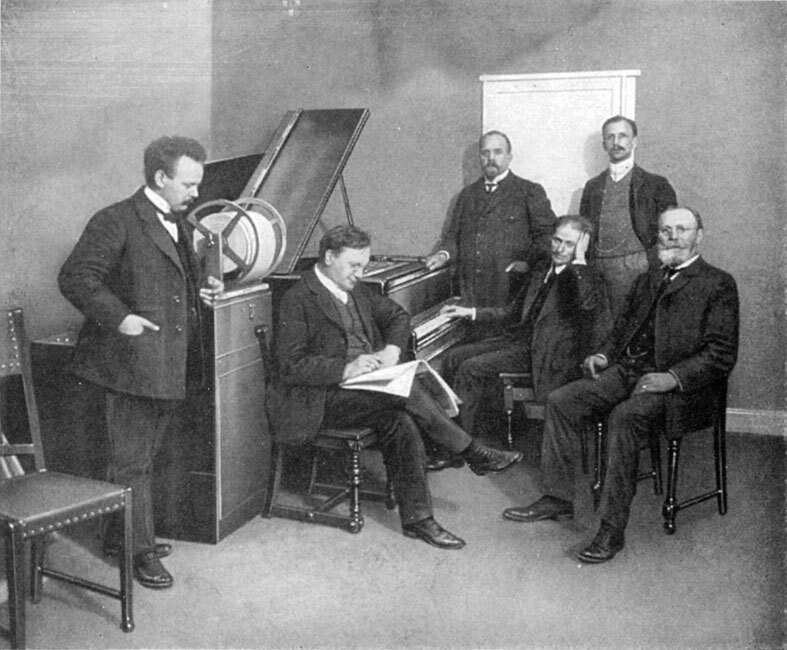 By the date when Raoul Pugno made the journey to Frankfurt, in January 1910, the piano had been moved, and the marking machine was no longer visible in the recording studio. Also in these early shots is a recording producer, shown following the score of the music being played, and on occasions marking it in pencil. Given the general lack of knowledge about the Philipps Duca, the catalogue of music rolls that was recorded was surprisingly wide-ranging. Roughly two thousand titles were produced, of which some 1400 were of classical and light classical music, played by the well-known pianists of the time. Inevitably there was much duplication with the other German companies of Welte and Hupfeld, with d'Albert, Busoni, Carreño, Friedheim, Gabrilowitsch, Grünfeld, Lamond, Pugno, Saint-Saëns, Scharwenka and Schnabel being amongst the best-known to have recorded for all three systems. 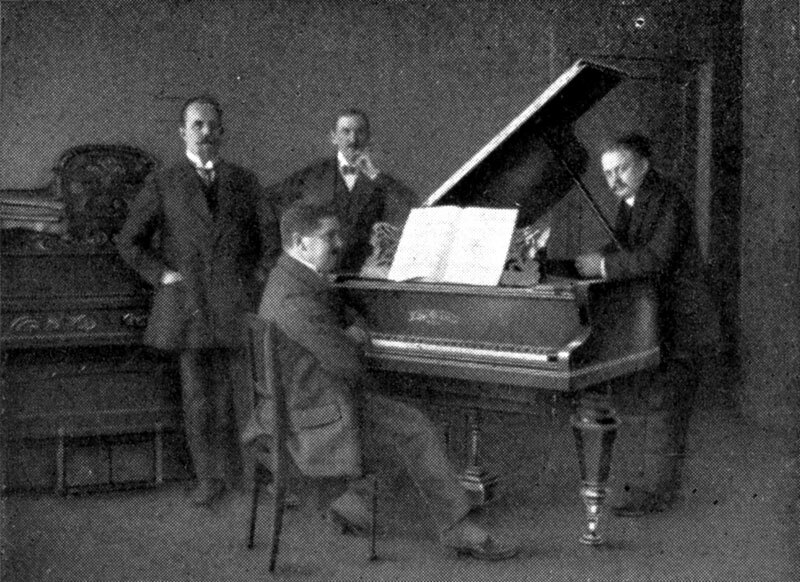 One of the first pianists to record for the Duca was Carl Friedberg (1872-1955), who studied with Clara Schumann, and who was an outstanding exponent of Brahms, having formed a particular friendship with the elderly composer. He was a student and later professor at the Frankfurt Conservatory, so it is perhaps not so surprising that he should have been amongst the first to try out the local recording piano. 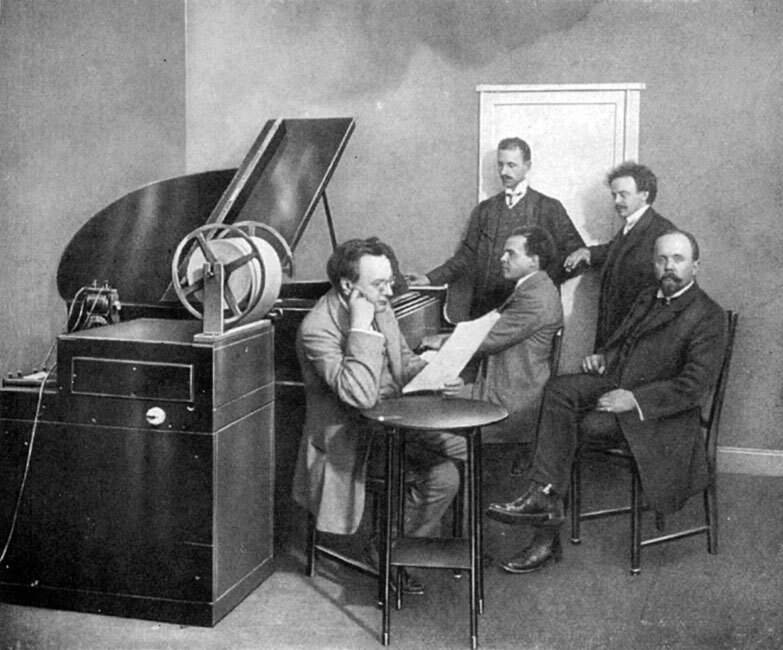 With the piano tightly in the corner of the recording room, and the large roll of blank paper in close proximity, Friedberg would have needed considerable reserves of inspiration to turn in a suitably musical performance! It is good to have a photograph of Artur Schnabel at a recording piano, since there has been a widely circulated rumour for many years that he did not like the reproducing piano at all. 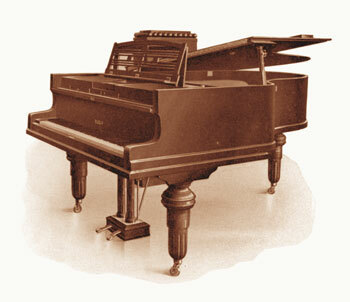 In fact, his reported quip, that he had seventeen degrees of touch, whereas one particular piano only had sixteen, was most likely a sharp piece of black propaganda put out by Ampico, for whom he recorded in the 1920s, to give the impression that Aeolian's Duo-Art worked in steps, whereas the Ampico had smooth dynamic changes. This technical distinction is not borne out in practice, since the Duo-Art's notional steps function like miniature crescendos and diminuendos, and their effect is modified by the number of notes being played at any one time. 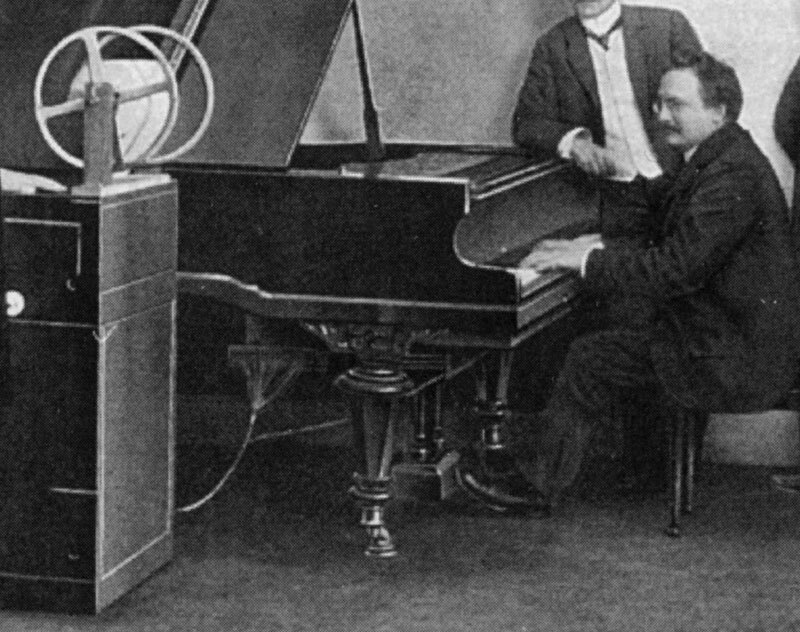 At any rate, Schnabel recorded at least 56 rolls, for four different companies, and you can read more about this controversy on our Pianolists page. it must have had at least 17 degrees of touch! There were four main variants of the Duca, as there were of the Welte-Mignon, each with its own niche amongst the ranks of wealthy European society. 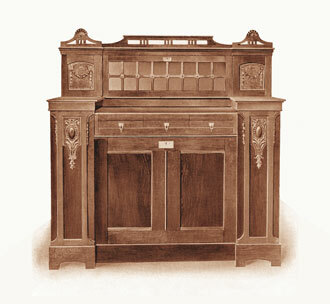 Similar to the original Welte-Mignon was the cabinet model, with no keyboard, which could be finished in a decorative style to suit the existing furnishings of its prospective purchaser. Two models of upright piano were produced at first, the larger looking very much like the early Hupfeld Dea uprights. 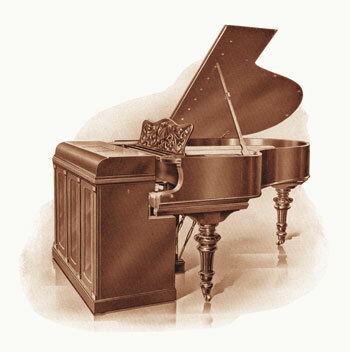 The Duca grand reproducing piano may have been the first such instrument to have been developed, since Welte did not install its Mignon into Steinway grand pianos until the autumn of 1913. 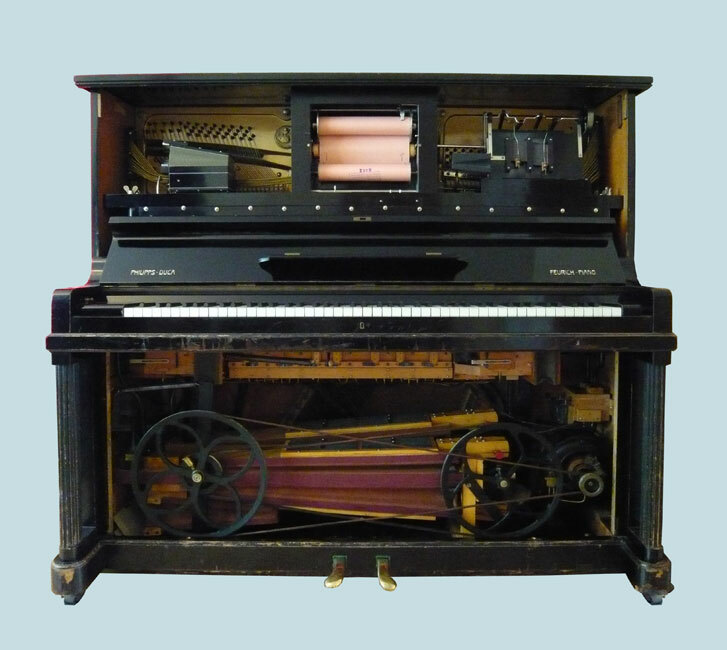 Finally, for those who had their own piano which they wished to keep and use for listening to Duca recordings, the push-up model fitted in front of a normal piano, and played by means of a set of felt-covered fingers, rather like the original Pianola some fifteen years before. The Duca has been the least well known of the three German reproducing pianos from the period before the First World War. It was the last to be developed, and its catalogue was smaller than the others, though still quite substantial. Those of us who are involved with the Pianola Institute have heard hundreds of different reproducing pianos over a period of thirty or more years, and it is quite clear that only in very recent times has the expertise towards these instruments come anywhere near that of the original musicians and technicians. It is to be hoped that someone will take up the challenge of restoring a Duca to first-class playing condition, and ideally a restorer who is thoughtful enough to listen to and act upon musical advice. 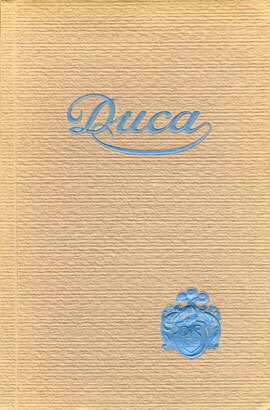 For a start, a process of research needs to be instigated to locate collections of Duca rolls, and to prevent public institutions from selling or destroying them, as has happened in the past. It will be a most interesting process to observe. The Philipps Pianella Orchestrions - A page on the website of the Mechanical Music Press, written by Terry Hathaway, and devoted to Philipps orchestrions of all types.